Remember how I said the day after "Penguins Marching" that I was trying to do something similar, but with rocky mountains? I finally figured out how to do it, and what wasn't working. However, I must admit that my favorite part of this piece is the little trees made out of semiprecious stone chips and smalti filati. I need to find an excuse to make more of these. I LOVE those little trees!! 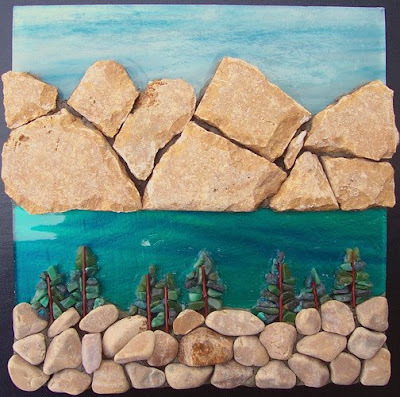 I am not sure if you said this or not, but what is your substrate for these mosaic pieces? How are you finishing the edges? Just curious!